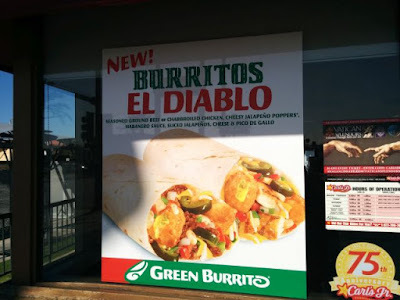 New Burrito El Diablo at Hardee's and Carl's Jr. The Thickburger El Diablo gets the burrito treatment at Carl's Jr. and Hardee's, or rather those locations that include a Green Burrito or Red Burrito, respectively. The new Burrito El Diablo features beef or chicken, Jalapeno Poppers, sliced jalapenos, shredded cheese, pico de gallo, and habanero sauce wrapped up in a flour tortilla. For whatever reason, the Red Burrito version is then grilled but the Green Burrito version is not. The burrito goes for $4.79 at my local Carl's Jr. (I would note that my local Carl's Jr. seems more expensive than most).